Most people just add their beauty products to their monthly shopping list, and if they run out in the middle of the month they either go buy more or they frantically search the internet for cheaper products, there is an alternative option, make your own beauty products at home! Having a few recipes on hand for when you run out of your regular products is also a great way to reduce your stress and keep yourself organized. Face & Hair Nourishment – The avocado is a delicious fruit that a lot of people do not actually enjoy eating, but removing the skin and pit and mashing the avocado into a thick paste and applying it to your face and hair for 15 minutes will give you skin and hair that looks refreshed. Rosemary & Lavender for thick hair – Rosemary oil and lavender oil with filtered water make a great rinse that makes your hair look thicker. Blackheads gone – A great mixture of lemon and honey makes blackheads go away. Facial exfoliation – Brown sugar with some olive oil is an effective exfoliator. White Smiles – Baking soda and lemon juice are a great teeth whitening product. Skin Buffer – For silky smooth skin after shaving a mixture of sugar, olive oil and lemon juice provides the perfect solution. Dark Circles under the Eyes – Chilled cucumber or potato slices work better than any other shop bought product. Baggy Eyes – Herbs have multiple uses, and fresh herbs in a cold face cloth placed over the eyes will remove the baggy eye look. Luscious Lips – For great looking lips without having to spend money, use beetroot or fresh rose petals. Smooth Hands – Every woman needs soft and smooth hands, for the best homemade solution you mix some cocoa butter, essential oil and orange juice which is not greasy at all. 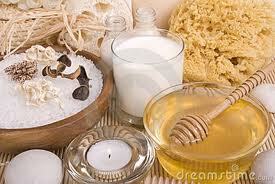 Home beauty is cheaper, by making your own beauty products you have full control over the ingredients as well. Love this! I have also tried cold tea bags for eye masks before on the advice of my mum but I don’t know if she was having me on or not! Lol!